This little parlour may not offer the finest plugged-in experience we've ever had, but in every other respect - and at this price - just buy one. Great acoustic tones. Nice build and choice of materials. Price. Tuners. You'll want an outboard EQ if you're playing plugged-in. 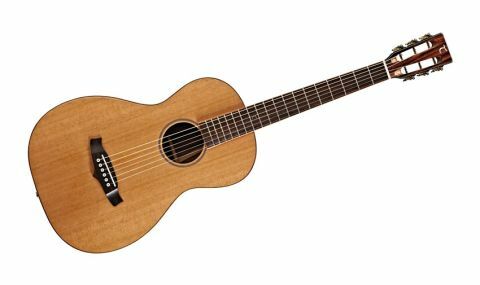 Tanglewood's new Java series offers figured woods and impressive build quality at a surprising price point. We put the TWJP E electro acoustic through it's parlour-sized paces. "It's the striped, rosewood-like amara sides and back that are the real talking points"
The three-piece neck, which joins the body via a traditional dovetail is a big-ish rounded C. You can't expect a perfect fret job in this price range, and although it's tidy enough, there are some sharp-edged ends and slightly rough crowns that give a mildly scratchy tonality to bends. The downside of the relatively light mahogany fingerboard binding is that the small side dots lack contrast and make you think a little about your positioning, especially when switching between the 12-fret parlour and the 14-fret folk necks. "Lows are tight and its highs are well rounded"
With a relatively trim depth, the guitar feels very comfortable played seated. Lows are tight and its highs are well rounded. If you're not used to a parlour's diminutive size, it takes some getting used to, but don't be surprised if you fall for its charms: a lovely at-home or travel guitar but with surprising projection that really should be auditioned for focused fingerpicking, not to mention more robust blues and slide licks. The lack of body bulk affects strumming styles, but if you have your flat pick (or thumbpick) and fingers technique down, you might find your soul mate. "Plugged in, things are equally healthy, although the tonality has too much midrange 'honk'"
Plugged in, things are equally healthy, although the tonality has too much midrange 'honk' when listening flat. Scooping out around 200Hz cures a feedback hotspot, but a more general midrange scoop produces a more usable and realistic sound. The onboard tone control is of little help, simply offering some high-end reduction or enhancement. Either from an outboard preamp or amp/PA EQ, be prepared to tweak.